Community members and students turned out to carry 24 bags of trash out of the Guy Ford section of the Watauga River. In total, Big Sweep participants removed 7,810 pounds of trash from Western North Carolina’s waterways. On September 9, more than 253 people from all walks of life turned out to remove more than 7,810 pounds of trash — 3.9 tons! — from Western North Carolina’s waterways as part of our 30th annual NC Big Sweep. 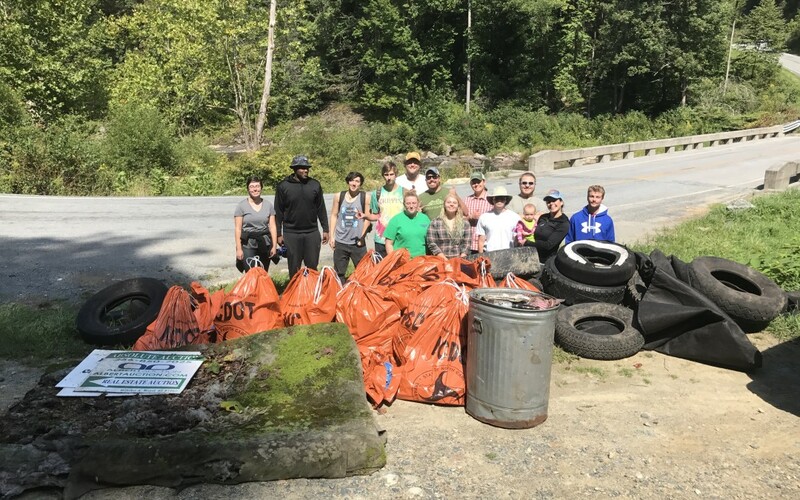 Through a series of river and roadside cleanups in Buncombe, Henderson, Transylvania, and Watauga counties, Mountaintrue joined key partners Asheville Greenworks, the Waterkeeper Alliance and AmeriCorps Project Conserve to clean 50 miles of rivers and streams. 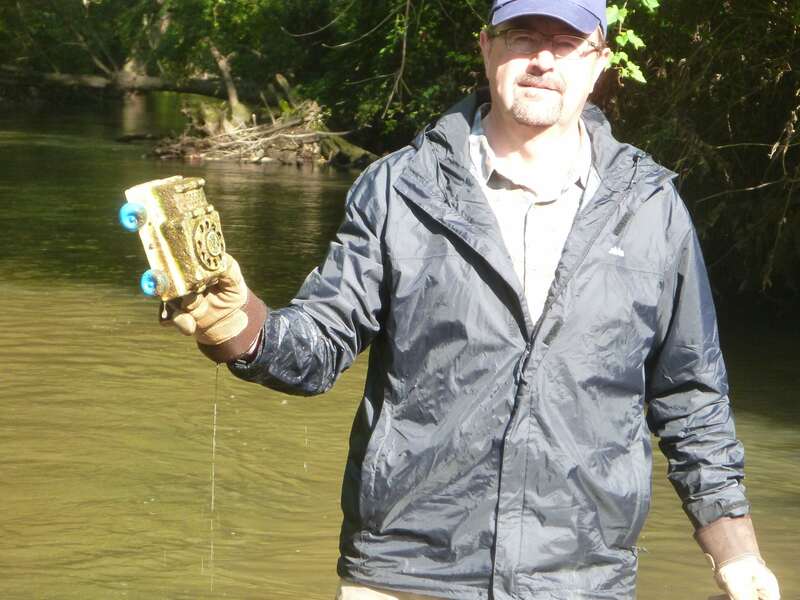 As a 30th annual event, Big Sweep falls into a long-standing tradition of volunteers in North Carolina cleaning up waterways in their communities. The event could not have happened without Asheville Greenworks, a key leader in the Big Sweep effort, or our Big Sweep sponsors, which included Asheville Outdoor Center, Griffin Waste Services, Sierra Nevada Brewing Co., Henderson County and French Broad Outfitters. Fifteen members of the Hendersonville Rotary Club showed up in full force for the event, and were joined by State Senator Chuck Edwards in cleaning up Mud Creek. 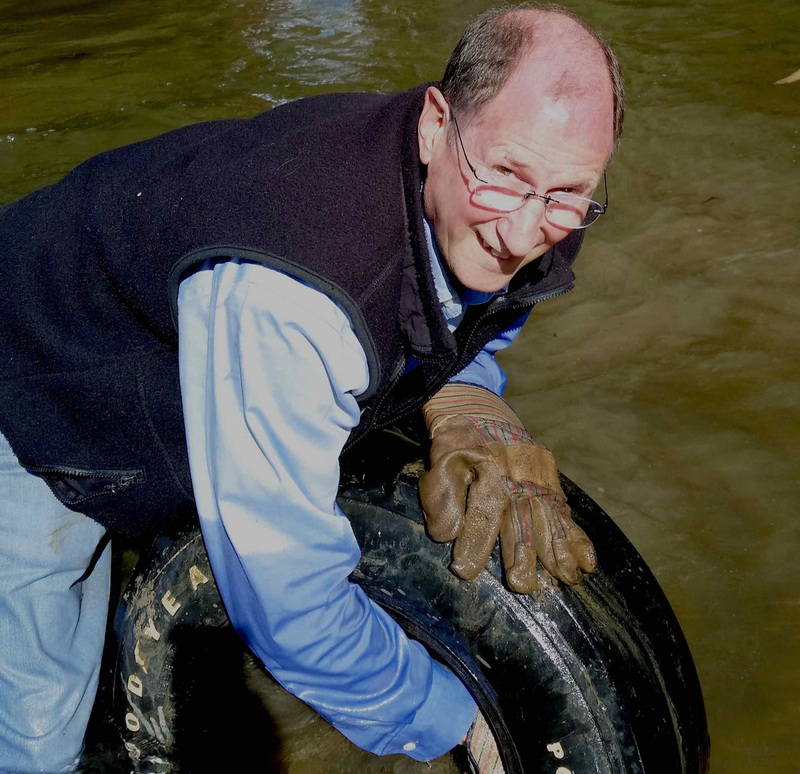 A volunteer with the Hendersonville Rotary Club removes a tire from Mud Creek. Our waterways attract quite the collection of bizarre trash. State Senator Chuck Edwards finds a toy ambulance in Mud Creek. The Hendersonville Rotary Club with collected trash from Mud Creek. State Senator Chuck Edwards (front row, second from right) joined the group, wearing a MountainTrue hat. The Broad River Alliance named the event their “Sarah Sweep” for the second year in a row in memory of Sarah Spencer, an active volunteer who was 26-years-old when she was killed in a car accident in 2016. The event served Sarah’s memory proud, as 22 volunteers turned out to remove 1400 pounds of trash – including 32 tires! – along five miles of the First Broad River. 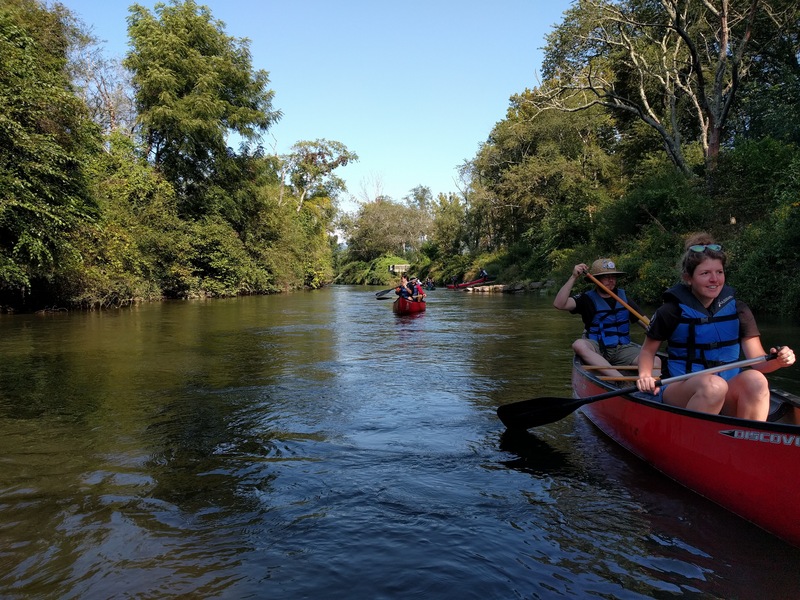 The French Broad Riverkeeper’s team was based out of Westfeldt River Park, and mainly received volunteers from Asheville Greenworks and AmeriCorps Project Conserve on the French Broad in Transylvania County. (add numbers from cleanup) When the work was done, the volunteers enjoyed an after party at Westfeldt River Park sponsored by Sierra Nevada Brewing Co.
And in the High Country, a team of 20 volunteers cleaned up the Guy Ford section of the Watauga River, which was recently donated to Watauga County by the Blue Ridge Conservancy for recreation. “Thank you to all our amazing volunteers who made the 30th Annual Big Sweep a success,” said Andy Hill, Watauga Riverkeeper and MountainTrue’s High Country Regional Director. 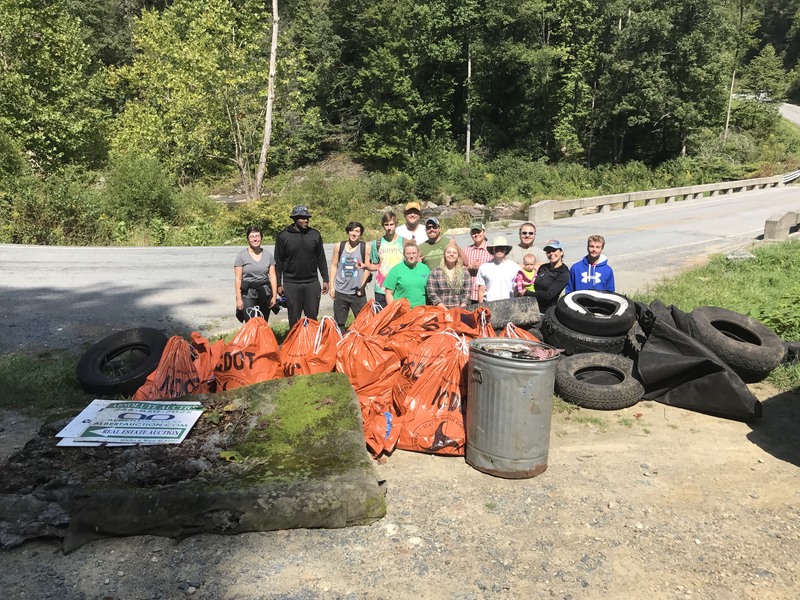 “[And] major appreciation to Edgar Peck and the Blue Ridge Conservancy for making Guy Ford Access another place for people to enjoy the Watauga River.” The cleanup crews, consisting mainly of community members and students, filled 24 bags of trash, including a tent, a mattress and a rusty trash can. Volunteers in all of our regions noticed an abundance of a few particular pieces of trash: plastic bottles and tires. Plastic bottles remain a huge threat to our waterways, and the Big Sweep was a reminder to volunteers and community partners that litter on our streets often ends up in our streams and rivers as stormwater runoff. By tackling the problem at the source, efforts to reduce littering and careless garbage disposal can greatly reduce the burdens on our waterways each year. Big Sweep participants also collected at least 115 tires this year, and some groups even had designated Tire Teams to remove them. Tires often end up in waterways because they are seen as too difficult or expensive to dispose of properly. Dumped in streams, they become environmental hazards. The best way to recycle tires is through your local county recycling program. Henderson and Transylvania counties will dispose of five tires for free per household, per year; Buncombe County accepts 10. For other items that are difficult to recycle, from packing peanuts, to printer cartridges, to dog crates, take note of Asheville Greenworks’ Hard-2-Recycle events here. Thank you to all of our volunteers, community partners, and sponsors that made the Big Sweep happen this year. By helping us fund our Green, Broad, French Broad and Watauga Riverkeeper programs, you’re helping to remove thousands of pounds of trash from our waterways every year. We hope you’ll join us in your gloves and rain boots next year to make the next Big Sweep an even bigger success. AmeriCorps Project Conserve Members clean up the French Broad River in kayaks.